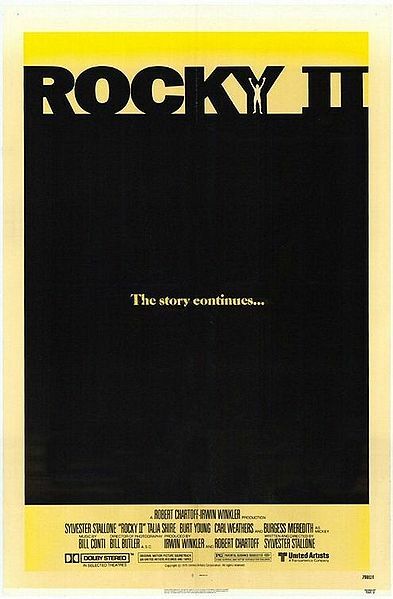 Rocky 2 is one of the best sequels in US cinema history. The way the original Rocky film was concluded, and that films massive critical and commercial success, naturally dictated that a follow-up had to be made. Luckily for the viewer, the second film is a logical progression from the first film, a perfect companion piece to it and a fine film in its own right. It also hosts the finest boxing fight in cinematic history, in my opinion. This film is great, and that is as much as a review you are going to get from me on the subject, but it is essentially a lead-in to a mesmerising, titanic boxing match – a re-match, in fact – between reigning champion Apollo Creed and challenger Rocky Balboa. I remember watching this on Christmas Eve, 1982, on VHS, with the excitement of Christmas relegated to the periphery as I sat, Findus French Bread Pizza in a sweaty hand, gripped with excitement as this fight ebbed and flowed. The final seconds of the fight had me breathless (literally) and feeling like an electrical charge was running through me. What follows is a movie scene that is pure cinematic pleasure, a thorough justification of the medium as entertainment, and a scene that age does not dim, dilute or lessen in its impact.